We regret to announce that Monsignor Vincent Keane ’52 has passed away. We mourn the loss of a holy priest, our former teacher and Rector-Principal. May he rest in the Peace of Christ. Monsignor Keane served at Cathedral Prep, Brooklyn from 1959-1963 as Prefect of Students and as History and Religion teacher. 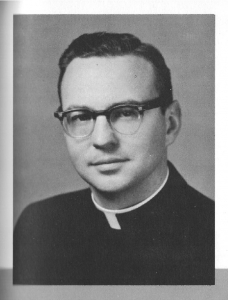 Monsignor Keane then served at Cathedral Prep, Elmhurst from 1963-1979 as Rector-Principal (1974-1979), as well as Prefect of Students, History and Religion teacher, and Spiritual Director. Monsignor Keane also served the Diocese of Brooklyn as Pastor of the Parishes of Saint Francis de Sales (Belle Harbor), and Our Lady of the Blessed Sacrament (Bayside), Associate Pastor of SS. Joachim and Anne (Queens Village) as well as Parochial Vicar of Saint Pascal Baylon (St. Albans).